Whether someone performing work for a company is an independent contractor rather than an employee has a significant impact on the business. For an employee, the company must withhold income tax, Social Security, and Medicare from wages paid, pay overtime, provide workers’ compensation coverage, and the individual must be covered under the employer’s employee benefit plans. None of these things are required if the person in question is an independent contractor. On January 29, 2019, in Jammal, et. al. v. American Family Insurance, et. al., Case No. 17-4125, the Sixth Circuit U.S. Court of Appeals, whose jurisdiction includes Tennessee, overturned an Ohio federal district court’s decision that thousands of former American Family insurance agents were employees rather than independent contractors. The plaintiffs claimed that because they had been misclassified as independent contractors rather than employees, they had been denied benefits under American Family’s employee benefit plans, in violation of the Employee Retirement Income Security Act (ERISA). It is the intent of the parties hereto that you are not an employee of the Company for any purpose, but are an independent contractor for all purposes, including federal taxation with full control of your activities and the right to exercise independent judgment as to time, place and manner of soliciting insurance, servicing policyholders and otherwise carrying out the provisions of this agreement. As an independent contractor you are responsible for your self-employment taxes and are not eligible for various employee benefits such as Workers and Unemployment Compensation … Rates, rules, regulations and all provisions contained in the Company’s Agent’s Manuals and all changes to them shall be binding upon you. If any inconsistency or ambiguity exists between this agreement and such rate, rule, regulation, provision or other statement or statements, whether written or oral, this agreement shall control. Practice Pointer: For companies wishing to designate individuals performing services for them as independent contractors and not employees, the Sixth Circuit’s decision highlights the importance of an express, written independent contractor agreement such as the one the court relied on in American Family Insurance. 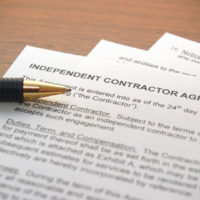 While the most important factor in determining independent-contractor status remains the right to control how, when and where the individual performs work, the Sixth Circuit’s decision shows that an express agreement confirming independent-contractor status is an important part of supporting the company’s position. If you’re an employer in Tennessee or elsewhere facing an issue related to independent contractor versus employee status, obtain professional and thorough legal assistance by contacting the Law Offices of Cary Schwimmer at 901-753-5537 or visiting our website at schwimmerfirm.com. Our office address is 1661 International Place Drive, Suite 400, Memphis, TN 38120. For over thirty years, Mr. Schwimmer has represented clients in all phases of labor relations and employment law on a national basis. In addition to his active litigation and counseling practice, Mr. Schwimmer is a frequent speaker before management and legal groups. He is the former Management Chairperson of the American Bar Association’s Subcommittee on Privacy in the Workplace. Businesses of any size face the same employment law issues. Every company can benefit from experienced legal advice and representation. Disclaimer: Certification as a Labor and Employment Law specialist is not currently available in Tennessee. Please note that Law Offices of Cary Schwimmer will not represent you or your organization until we expressly agree to do so and are sure that doing so will not create a conflict of interest. Accordingly, please do not send us any information about any matter that may involve you or your organization until we have agreed in writing to act as your lawyer. Please keep in mind that merely contacting Law Offices of Cary Schwimmer will not establish an attorney-client relationship, and will not require or guarantee confidentiality of any information you send. If you or your organization are seeking legal representation from us, we will take you through our conflict-of-interest and other regular intake procedures to see if we can represent you. In no event will we agree to represent you or your organization in any matter unless we have had direct personal contact with you to learn about the matter. When we agree in writing to represent you or your organization, you or the organization will be our client, and we may then exchange information freely. © 2017 - 2019 Law Offices of Cary Schwimmer, Attorney at Law. All rights reserved.